Since moving into rodhus in the spring of 2011 Elaine has built a fantastic studio/gallery. Elaine was the first artist to take space at rodhus, many more have followed. 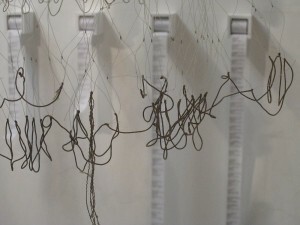 There is a strong design and making thread to her work. Elaine says ‘Making and creating is like breathing, it is a personal imperative and is a defining feature of my life… I can’t remember when I wasn’t making stuff – its a reflexive response’. Streetcombing, her first installation work at rodhus featured lost and dropped items found over a 12 month period, mainly in and around Brighton, but also from other places that she had visited. In order to govern and guide her, Elaine set herself a set of rules and documented each item that she found, recording the location, date and description of the find.